Veteran Scottish actor Ian McDiarmid says he has "no idea" if he will ever again play the role of Emperor Palpatine in the Star Wars films. But the 73-year-old told BBC Scotland he didn't want anyone else to take the role he has played in four movies. McDiarmid, from Carnoustie in Angus, has appeared in almost 50 films and starred in theatre for 50 years. But he admits that his appearances as the dark villain are the ones for which he is best known. McDiarmid, who is currently appearing in What Shadows at the Lyceum Theatre in Edinburgh, first appeared as Darth Vader's master in Return of the Jedi in 1983, overseeing the last stages of the second Death Star's construction. In an interview with BBC Scotland's Timeline programme, the actor, who was only 37 when he got the part, says: "They wanted the oldest person in the world because in Return of the Jedi Palpatine is about 120 I think. "They had cast someone who was nearer to that age than I was but for some reason he could not continue. "I think the contact lens tests were rather unpleasant. They were hard glass." It was another 16 years before McDiarmid returned with the Star Wars prequels in 1999's The Phantom Menace, which is set decades before the original films. McDiarmid says: "I was alright for Return of the Jedi because I was under four hours of make-up so no-one really knew what I looked like or sounded like because I lower my voice very much for the film. "So I could be anonymous. "But when the prequels happened Palpatine was his younger self which was about my age then, in his 50s. "Apart from a not-very-flattering hairpiece I looked like me, so privacy was over." McDiarmid says he is often recognised for his role but most fans are "very friendly". He says: "I don't feel oppressed by it. I don't feel every minute of every day someone is going to ask for an autograph." 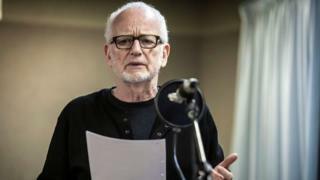 As the Star Wars universe continues to generate spin-off movies, McDiarmid says he has no idea if he will ever again be called on to play the Emperor. He says: "I suppose there must be a chance but I think you'd find out about it more quickly than I would. "As far as the new films are concerned, I'm dead. There is no question about that. "But there is what they call the anthology series and actually the most recent one, Rogue One, was about the time when I was in charge. "I was referred to a few times, Darth Vader popped up, but you did not see me. "Maybe they are keeping me as a surprise for later but I have no idea. Of course, I don't want anyone else to play him." McDiarmid is currently appearing at the Lyceum Theatre in Edinburgh for the first time since 1972 when he played Hitler, on stilts in a huge head mask, in Brecht's play Schweik in the Second World War. In What Shadows, he plays Tory politician Enoch Powell whose 'Rivers of Blood' speech was one of the most polarising political moments of the 1960s.